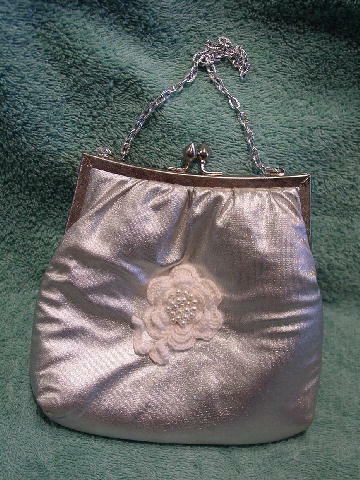 This vintage silver lame fabric purse has a padded exterior. The front has a white cord flower with faux white pearls in the center. The top has a silver-tone bypass closure. It has a white fabric lining and interior open pocket and was made in Hong Kong. It has a 14" silver-tone chain which can be tucked in and the purse carried as a clutch.